ROCKY MOUNT, NORTH CAROLINA – Lt. Col. James Mercer, US Army (Ret.) was recently named as one of twelve to be inducted into the 2018 Twin County Hall of Fame. He will be honored during the 15th Annual Induction Banquet at the Rocky Mount Event Center on Thursday, November 8, 2018. 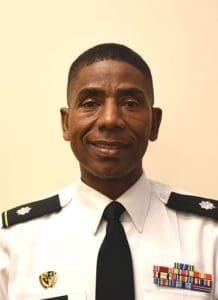 Mercer is currently the Director of Military Studies at NC Wesleyan College and also coordinates the Army Reserve Officers’ Training Corps (ROTC) program for the college. Lt. Col. James Mercer was born in Edgecombe County and raised in Nash County. He joined the US Army after graduating from North Edgecombe High School. He retired with 30 years of military service in the US Army, US Army Reserve and the Army National Guard. During his distinguished civilian career, he served in multiple roles including: police officer and firefighter for the City of Rocky Mount, Deputy Fire Marshal for Nash County Emergency Services, Public Safety Instructor at Nash and Edgecombe Community Colleges, Director of Public Safety Training for Nash Community College, Director of Emergency Management and Fire Marshal for Edgecombe County, Director of Emergency Management for Fayetteville State University and later for the City of Raleigh, where he retired in 2012. “This is a big deal for me and pretty cool, I must say. What an incredible honor it is to be recognized by my community. I want to thank all those who mentored me, impacted me and helped me along the way. It was a village that got Lt. Col. (Ret) James Mercer from Battleboro, North Carolina, to where I am today,” stated Mercer. The Twin County Museum and Hall of Fame’s mission is to celebrate the history, culture, people and accomplishments of Edgecombe and Nash counties in eastern North Carolina. For more information about the Twin County Hall of Fame and for tickets to the 15th Annual Induction Banquet, visit www.tchof.org.